Stunning 'midi romaine' with burgundy outer leaves with crunchy, sweet, pale green hearts. Sow regularly for delicious lettuce all summer long. 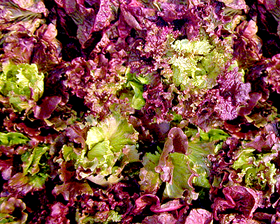 Lettuce Sapphire is ideal in containers. Sow seeds thinly direct outside or in containers, 13mm deep. Sow regularly for continuous fresh lettuce from March through the summer.